Being a noteworthy enterprise of this industry, we are offering a wide spectrum of Continuous Casting Machine. Capacity: 4/7, 6/11, 9/16 & 10 Mtr Radius. Continuous casting, also called strand casting, is the process whereby molten metal is solidified into a "semi finished" billet, bloom, or slab for subsequent rolling in the finishing mills. Prior to the introduction of continuous casting in the 1950s, steel was poured into stationary molds to form ingots. Since then, "continuous casting" has evolved to achieve improved yield, quality, productivity and cost efficiency. It allows lower-cost production of metal sections with better quality, due to the inherently lower costs of continuous, standardized production of a product, as well as providing increased control over the process through automation. This process is used most frequently to cast steel (in terms of tonnage cast). Aluminium and copper are also continuously cast. Molten metal (known as hot metal in industry) is tapped into the ladle from furnaces. 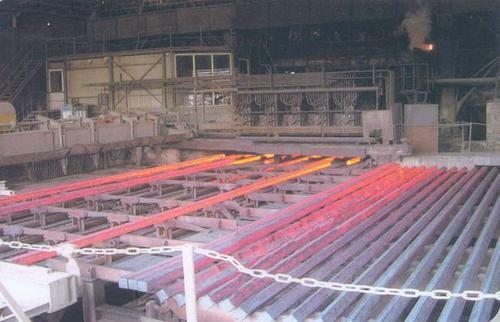 After undergoing any ladle treatments, such as alloying and degassing, and arriving at the correct temperature, the ladle is transported to the top of the casting machine. Usually, the ladle sits in a slot on a rotating turret at the casting machine; one ladle is 'on cast' (feeding the casting machine) while the other is made ready, and is switched to the casting position once the first ladle is empty. From the ladle, the hot metal is transferred via a refractory shroud (pipe) to a holding bath called a tundish. The tundish allows a reservoir of metal to feed the casting machine while ladles are switched, thus acting as a buffer of hot metal, as well as smoothing out flow, regulating metal feed to the molds and cleaning the metal.